I came across a very neat find the other day. Jodi’s sister Joann was nice enough to lend our team Jodi’s complete archive of VHS tapes that contained all of her resume work. I’m copying over the video so we can have a digital copy of her work. Just like Jodi, I have dozens of old VHS tapes with my earlier work in TV recorded onto them. It’s some of my earliest (and worst!) material of my career. But it’s always fun for journalists to watch the work we did in the ‘early days’ of our careers. Jodi was like a lot of people in TV News. She was very good about recording her stand-ups, anchor montages and stories when she was reporting. Generally, someone in the TV News business will take these clips and narrow them down to the best clips and make an 8-10 minute resume reel. Back then, that reel was on VHS tape and was duplicated a few times onto other tapes and sent to news directors around the country in the hopes they liked what they saw and would hire you. These days, it’s much different. With the latest technology, I am able to record a clip off of the TV onto my DVR and then pull those clips into my Mac computer’s editing software and edit it down to the best reel possible. Then I can upload the finished product to my website and just email a link to a news director. It’s much less work than duplicating VHS tapes in real-time! Jodi doing a test-read for her anchor coach at Magid. Obviously, Jodi had been working at KGAN-TV in Iowa City when she was working on this VHS tape. She would later get a job as morning anchor at KIMT-TV in Mason City, Iowa. Then-News Director Doug Merbach more than likely received one of these VHS tapes with one of her business card attached. Also discovered in the big box of tapes was her anchor test-reads from the Frank N. Magid Associates agency. Many times anchors would go to an agency or a consultant and get help with their on-air skills. I remember when I worked in Tucson, my co-anchor and I at the time went to Dallas to work with a consultant on our chemistry, etc. Basically, you go through some on-air test reads and a consultant tells you what you can change and how you can look more comfortable on-air. The attached image is of Jodi doing such read with a coach at Magid. It was a neat video to see. I’ll try and get some video clipped and added to the website for people to see in the future. There was always the warning from TV agents to put your ‘best stuff’ at the beginning of of your resume tape. Because news directors were (and still are) notorious for watching a few seconds and popping the tape out if they didn’t like what you looked like, how you sounded, how you reported/anchored, etc. So it was important to make a great first impression. Because many times, it was all you had. But Mr. Merbach must have liked something in Jodi because he hired her. And I have been seeing hours and hours of video from her morning newscasts. As we all know from her journal and other reports, Jodi had big aspirations to go far in TV News. And at the time she disappeared, no doubt had a great TV news reel in production in an effort to send out to news directors all over the country. And I’m sure each box came complete with a fresh KIMT-TV business card taped to the front. When you write these articles you shouldn’t write about your own life. If we wanted to know about your television career we would pick up the book about you. Oh wait that book was called, “Dead Air.” The book where you wrote all about your career and your experiences, I mean the disappearance of Jodi. Jodi was a role-model to me and many of my family members growing up. When we saw her we looked at her as a supermodel who was chasing her dreams. It was almost as if she was a real life barbie. A barbie with brains that is. We all looked up to her and this world has been robbed of a great person for the many painful years she has been missing. I couldn’t help but read the book you wrote, partly because I wanted a reason to feel closer to her again, and also because many of us believe there is a clue everyone else has missed that I may have discovered. Your take on the book was troublesome to me and a few members of my family who also chose to read it. A few family members refused to entertain the idea of some stranger who was trying to make money off of Jodi’s tragic story. For the couple who chose to read it felt like you spoke of yourself way too much. Also you had so many speculation theories about her personal life. Unless it was a fact and you have proof about such private things I would label it as private and possible bs. I wouldn’t considerate it good journalism to include such hurtful character assassination. Thanks for taking the time to write, and for visiting the website. understand how looking for a job in TV News works. It was an example. It’s what I know, so I was able to write about. Let me assure you, this website makes a few bucks a month…if that. 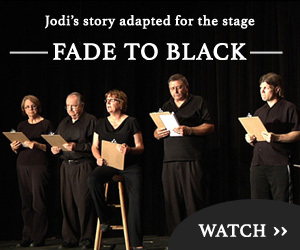 have come to this site, interested to learn more about Jodi’s story. us for keeping this search going and this website active. one. I hope we can. And I hope as a result, you can find closure. Thank you for telling about the vcr tapes and what they were used for.While you are watching them there may be a clue to help you and may be not. Keep up the good work. She needs to be found, as you said for closure for everyone in this case.